FC Kallon faces a nervous wait on the fitness of their skipper, Gibrilla Fofonah, after he hobbled out of Wednesday’s 0-0 draw with Anti-Drugs FC due to injury. 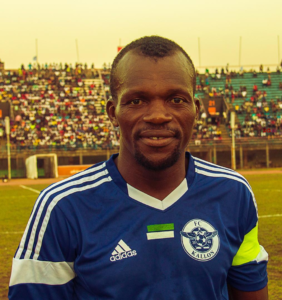 The defender appeared to have suffered from a groin injury from a challenge in just 35 minutes of their clash at the Siaka Stevens Stadium in Freetown. Fofonah was instantly replaced by Brima Mansaray, who could deputise his captain once again on Sunday when FC Kallon travels to face Mighty Blackpool at the Stadium. “I am not happy and was shocked with Gibo’s injury. We only hope he is fit before Sunday’s match, but all that depends on the medical team to ascertain the extent of his injury, and see if he could be fit for the Mighty Blackpool match,” FC Kallon coach, Amadiu Karim said, adding that they have a squad and players who can fit in every area.